Beautiful opalized polished Ammonite fossil from Madagascar. Beautiful opalized polished Ammonite fossil from Madagascar. Ammonites were cephalopods (predatory marine mollusks) similar to the modern Squid, Octopus and chambered Nautilus. The term ammonite refers to an extinct group of mollusks. The most frequently preserved portion of the ammonite is the hard shell. This shell served as protection for the soft tissue of the animal and also allowed the animal to achieve buoyancy in the marine environment in which it lived. Ammonites first appeared in the lower Devonian Period. Ammonites survived several mass extinctions during the 330 million years they lived on Earth. The end of the Cretaceous Period was also the end for these cephalopods. Ammonites are found as fossils in most countries throughout the world. 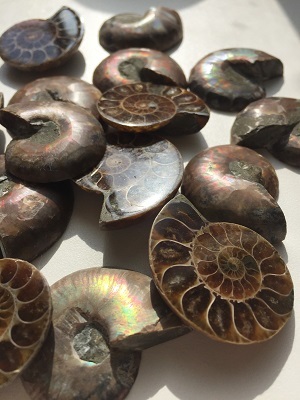 There are various myths surrounding Ammonite fossils. Ammonite promotes well-being, good health, prosperity, and good luck. The name Ammonite is derived from the shell's appearance: it resembles a ram's horn. In Egyptian mythology, the God Ammon looked like a man with horns like a ram. The ancient fossil was considered Ammons stone, thus inheriting the name, Ammonite. 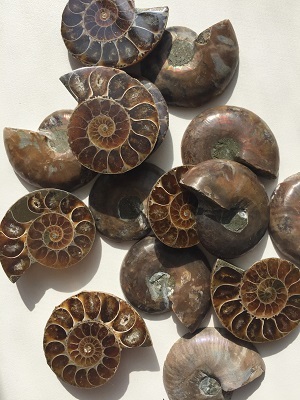 Metaphysically, Ammonite is considered to be a protective stone giving stability and structure to a person's life. 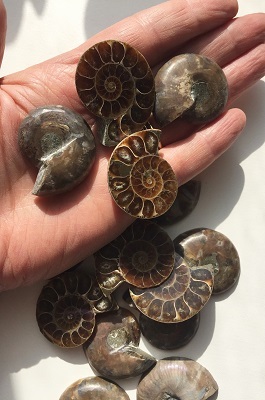 Ammonite is said to transform negativity into smooth flowing energy, increasing vitality and overall well-being. Ammonite is said to assist with childbirth, depression, and general survival instincts. Ammonite is a symbol of the higher forces of the universe and a reminder of the cycles in life.